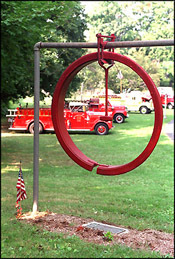 Boonton - (above) Part of the exhibits inside the museum on the grounds of the NJ Fireman's Home features old fire apparatus and firefighter equiptment. 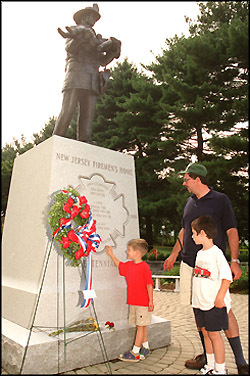 (above right) Peter Mone, of Basking Ridge, and his sons Chris and Billy read the plaque on the monument that marks the centennial of the NJ Fireman's Home. 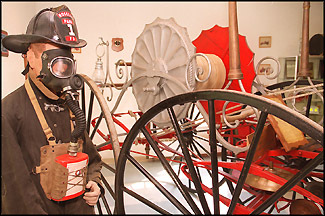 (below) Jack Wagner, of Summit sits in a 1926 American LaFrance Chemical Type fire truck at the antique fire truck exhibit in Boonton. Boonton - (above) An old style iron fire alarm bell is now a monument dedicated to "All Deceased Fireman in the State of New Jersey". Behind the bell in the background some of the antique fire trucks which are on display. 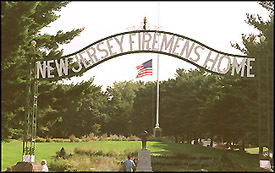 (top right) The entrance to the New Jersey Fireman's Home in Boonton with the American Flag at half mast behind the archway. 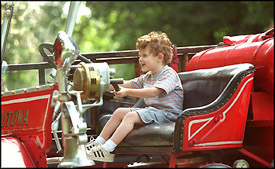 (above right) Jack Wagner, of Summit sits in a 1926 American LaFrance Chemical Type fire truck. (middle right) Frank Iurato, of the Totowa Fire Dept. prepares to "turn on the water" during the fire hose portion of the firefighter's competition. 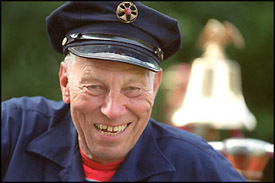 (lower right) Russ Fisher, of Boonton is all smiles while wearing his fireman's hat. Fisher brought his vintage 1921 LaFrance fire truck to the antique fire truck muster held at the New Jersey Fireman's home in Boonton. 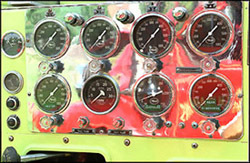 (right) Some of the gauges which are used on a 1950's vintage Mack fire truck. (below) Close-up view of lights and siren on board a vintage Mack fire truck which was among those on exhibit. We invite all readers to suggest related links or public information that will improve the content of the Municipal page. The Town, 2.45 square miles in area, is in the northwest part of Morris County approximately 22 miles west of the George Washington Bridge and 7 miles north of Morristown. The Town is an old established community with an abundance of park lands, older homes, and convenient access to all parts of the Tri-State Metropolitan area. The Town is located close to three major highways: N.J. Route 46 and U.S. Route 80 both running east-west across the state from New York City to eastern Pennsylvania and Route 287, which runs north-south through the center of the Town. Transportation to the Tri-State Metropolitan area is available via express and local commuter train service and by Lakeland bus service. NJ Transit provides the train service to Hoboken, New Jersey, which connects to PATH trains providing service to New York City. 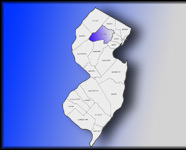 While many residents commute to work in Newark and New York City, many work in the surrounding areas of Morris County. Residents are primarily executives, skilled workers and independent business people. Part of the Town's business community consists of the Research and Development Center for Drew Chemical Corporation, two shopping centers, as well as numerous antique shops and other stores located on and around the Main Street Business district. Residential housing available in the Town includes one- and two-family homes, townhouses, and restored homes representing the Colonial, Victorian and Contemporary Eras.